Sisi Gelap Free Blogger Template is a elegant template with dark color background. Sidebar this template is no scroll (fixed position). 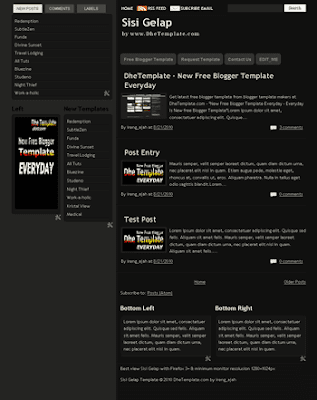 This template is 3 column blogger template for main post and 2 left sidebar, 2 footer column and tabview blogger ready. Best view this template with minimum monitor resolution is 1280×1024px. This template suitable for personal blog and also use CSS3 like in menu, widget sidebar and footer.